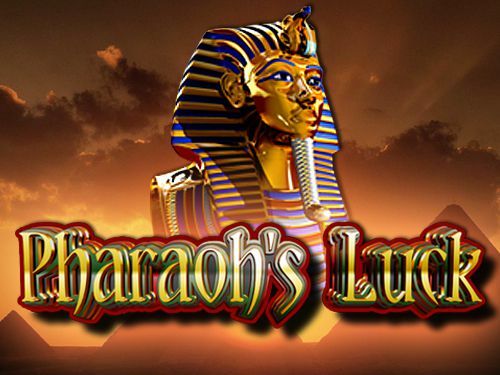 Embody the luck of the Pharaoh when you discover this ancient Egyptian 5 reel play slots online game. Enjoy a beautiful gameplay experience as you spin the wheel in front of a digitally enhanced pyramid landscape. Work alongside King Tut to match the pyramids and earn your way to free spin Valhalla. For 20 years, Eyecon have maintained their place in the lead of the online casino industry by coming up with some of the most unique, satisfying and thrilling slot games, making the players always return to their favourites. Their developers are dedicated to simplicity and quality, along with a special attention to detail. Pharaoh’s Luck takes on the theme of Ancient Egypt, where pyramids are filled with old uncovered mysteries and most importantly, lots of treasure. Come see if you’ve got luck on your side. There are many other great Eyecon games available at easy slot games. Sign up to Pay by mobile and claim your free spins! Egypt is a land worthy of adventures, thanks to the pyramids, mummies, legends and mysteries. There’s a lot to explore and a lot to find among all that sand, especially with such a rich culture behind it. Although most of the time pharaohs and their mummies hold curses, in this particular instance, they bring luck. That sounds like the perfect premise for exciting wins! Looking through the artefacts and graves, you might even find the 10.000x jackpot. This slot game has 5 reels and 25 paylines full of Egyptian symbols to enjoy, especially if you’re fascinated by mummies. The imposing head of Tutankhamun looms over the reels, carefully paying attention to the symbols you spin. No pressure, though, as he’s rooting for you at all times. You can also enjoy the beautiful scenery in the background, gazing over the pyramids at a pink sun set. When the graphics offer you such a nice atmosphere, there’s nothing left for you to do but bet. You can start your bet at 0.01 credit and go up to 0.20 credits, while also adjusting the number of active paylines. If you're interested, more slots bonuses UK promotions are shown here. 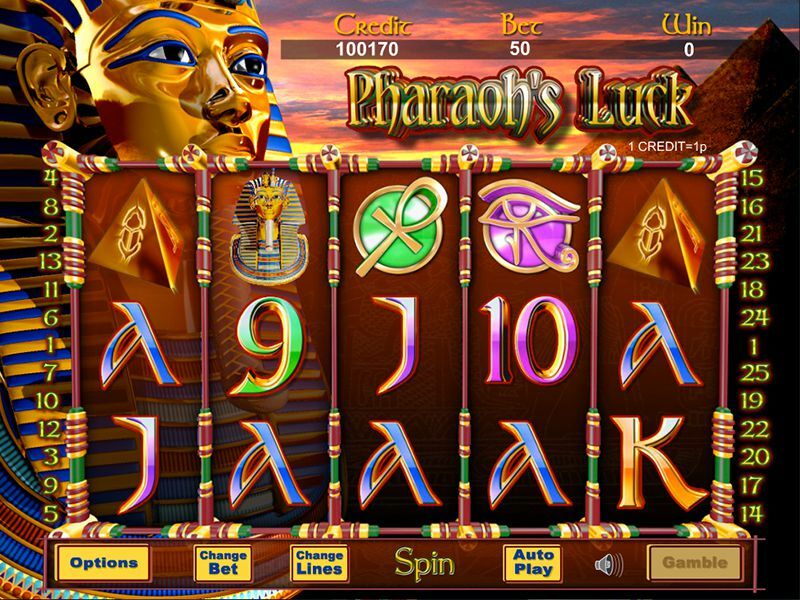 There’s not much more you can ask for than the exciting features that Pharaoh’s Luck has to offer. The history-filled Pyramid symbol is the Wild Card of this game and it substitutes any other symbol besides the Scatter, to form winning lines. Moreover, it doubles your wins when a matching combination is made. Watch out for the big 10.000x jackpot! It occurs when you spin 5 Wild symbols on an active payline. Then, you can live exactly like a pharaoh. The Pharaoh Mask symbol is the Scatter and spinning 3 or more anywhere on the reels activates an exciting Bonus Feature: you are taken before 15 masks and given the option to choose 3 of them, whichever might attract you more. Each mask holds a secret multiplier for you to win, so pick carefully, for at the end they are combined and can amount to a huge prize! If you enjoy a bit of risking, you can always use the Gamble feature, which allows you to bet double or nothing and try your luck. Discover our full range of casino slot games here. Pharaoh’s Luck promises an adventurous trip to the Egyptian pyramids, where there’s plenty to uncover and win. The graphics, though not extraordinary, form a beautiful and fitting setting for the game and they’re just enough to really insert the player into this wonderful pharaoh-ruled world, where golden treasures are at every step. Now check out another great game - Immortal Romance.